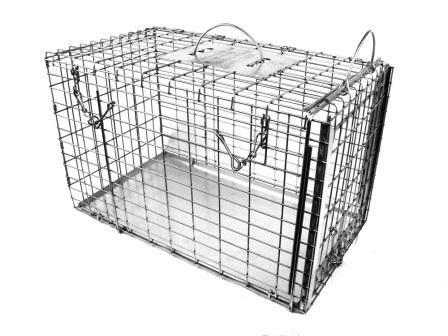 305 Model 305 is a transfer cage for rabbits, opossums and similar size animals. One end of this cage is a sliding door designed for easy transfer of animals from live traps. 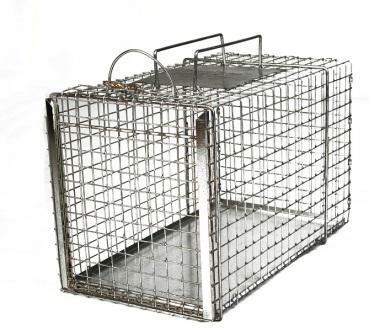 306 Model 305 is a transfer cage for rabbits, opossums and similar size animals. One end of this cage is a sliding door designed for easy transfer of animals from live traps. 306NC Model 306NC is designed specifically for transfer from traps 606NC,608NC, 608FN, and our new cat drop trap (DT1). It features the new and improved easy release door, extra large hand guard, and extra large double handles. 307 Model 307 is a sliding door cage for foxes, small dogs and similar size animals. One entire end of this cage is a sliding door designed for easy transfer from live traps. This transfer cage matches up nicely with trap model 608.3 and 608.5. 308 Model 308 is a sliding door cage for coyotes, average dogs and similar size animals. One entire end of this cage is a sliding door designed for easy transfer from live traps. This transfer cage matches up nicely with trap model 609.5. 305DD Model 305DD is a transfer cage with two doors for easy transportation of animals. It comes equipped with a sliding transfer door at one end and also a top opening door. The sliding door is designed to fit trap models 606 and 606.3. 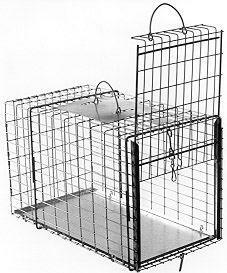 306DD Model 306DD is a transfer cage for cats and similar size animals. It comes equipped with a sliding transfer door at one end and also a top opening door. 307DD Model 307DD is a transfer cage for small dogs and similar size animals. It comes equipped with a sliding transfer door at one end and also a top opening door. The sliding door is designed to fit trap models 608.3 and 608.5.